Note from shop owner Arcadia Artistry is temporarily closed for vacation. Be back in January! Arcadia Artistry is temporarily closed for vacation. Be back in January! I recommend displaying thumbprint trees in a frame without glass on a stand during your event. The name Arcadia Artistry comes from the love of my life, my calico Arcadia. She likes to help me paint a lot... and by help me paint I mean walk all over my palette and make a mess! J paints and illustrates digitally. They have more than 10 years of experience as an illustrator. Jacey paints and illustrates digitally. They have more than 10 years of experience as an illustrator. I value my printing service for providing high quality prints using archival inks. They're a small team that loves to work with and support artists. All listings in this shop are for customized digital files. The high resolution print format files will be delivered via email 5-7 business days after you place your order. You may get 1 round of simple revisions after the first proof has been sent. Any additional changes after that may incur additional fees. Custom artwork may take up to a few weeks of additional time depending on the complexity of the request and where your order is in the queue. I retain all of the rights to all artwork and reserve the right to resell it. Please allow at least 5-7 business days to receive your file. Files will be delivered via Email and Etsy conversations. 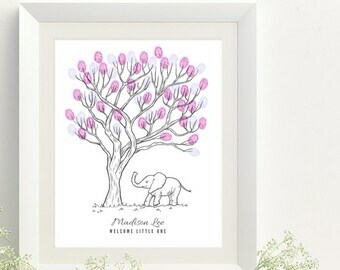 What size thumbprint tree print do a I need? TIP: If you want your tree to look less crowded, go with a larger size. I want my guests to sign next to their fingerprint. What kind of pen should I use? I prefer a fine tip Sharpie marker or a Sakura Micron pen. However I recommend that you test whatever pen you want to use over a fingerprint on some scrap paper before your event. Some pens will not write properly over the ink. Where can I find ink pads? Amazon, Joann Fabric, Michaels or other craft stores. 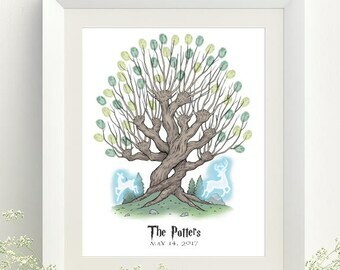 How should I display the print at the wedding or shower? The best way to display the print is matted in a frame (with the glass removed) on a stand holding it upright. That way your print is safe from getting damaged, but accessible so your guests can add their fingerprints. After your event you can put the glass back on the frame to preserve the fingerprints and keep it safe. See photo in "About" section. Please make sure you use paper with texture such as canvas paper or cardstock. Please DO NOT use glossy paper. Ink pads will smudge on glossy paper.